Hindi literature and works of literature in regional languages reflect the cosmos of Indian dreams and aspirations. There was a need for a platform to understand nuances of language as a reflection of changes in the cultural milieu. 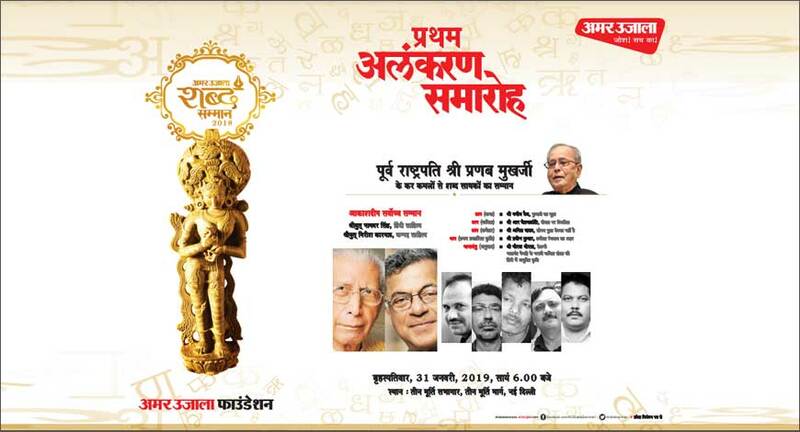 ‘Shabd Samman' was created by Amar Ujala group to recognize those who are working towards preserving the ethos of literature. The first chapter of 'Shabd Samman' concluded on 31st January 2019 in Delhi in the presence of ex-President Shri Pranab Mukherjee who awarded the winners. More than 1200 titles were submitted to a panel of jury members comprising of stalwart writers –Gyanranjan, Manglesh Dabral, Vishwanath Tripathi, Prayag Shukl and Sudhish Pichauri who judged the submissions. The award was not only for recognition of books with a literary value but for works of literature with a deep understanding of cultural shifts. Shabd Samman’s highest honour “Akashdeep” for overall contribution in literary the field was given to eminent critic Dr. Namwar Singh for Hindi Language and renowned artist-guru Girish Karnad for Non- Hindi language category. In the fiction category Manish Vaidya's collection 'Fugati Ka Joota' was recognized. In the poetry category, the collection of R Chetan Kranti’s ‘Veerta par Vichlit' and in the non-fiction category Anil Yadav's book 'Sonam Gupta Bewafa Nahi Hai' was given the award. Under the first work category, Praveen Kumar's work 'Chhabila Rangabaaz ka Shahar' has been recognized. In the translation category, Gorakh Thorath was embellished with an award 'Dekhni' (original work Bhalchandra Nemarde).Each awardee was presented with a cash reward along with a specially designed sculpture by Shri Ram Suttar. With the closure of the first chapter, Shabd Samman promises of more robust chapters in the coming years. Hindi Novelist and Short Story writer Pahal an influential literary magazine in the Hindi language is brought out by Gyanranjanji. The magazine publishes poetry, fiction, non-fiction, critique and essays concentrating on issues of contemporary interest coming out with 3-4 issues since 1973. In 2016 he was awarded Gyangareema Award. His most noted works have been: Sapna Nahi, Kabaadkhana, Meri Priya Sampadit Kahaniya His characters are mostly influenced by reality and not illusion and are looking at bringing about a change in the society. Manglesh Dabral is a prominent contemporary Indian poet who writes in Hindi. He has also been the editor of Jansatta, Sahara Samay and also National Book Trust as an Editorial Consultant. He has published five collections of poetry, namely, Pahar Par Lalten, Ghar Ka Rasta, Ham Jo Dekhte Hain, Awaz Bhi Ek Jagah Hai and Naye Yug Men Shatru, two collections of prose Lekhak Ki Roti and Kavi Ka Akelapan, and a travel diary Ek Bar Iowa. He has received the Sahitya Akademi Award given by Sahitya Akademi in 2000 for his poetry collection Ham Jo Dekhte Hain. A Hindi writer, he has around 20 publications to his credit which include literary criticism, memoirs and poetry collection. He was awarded: In 2014 - Moortidevi Award (The Moortidevi Award is an India literary award annually presented by the Bharatiya Jnanpith). In 2013 - Vyas Samman a literary award in India by K.K. Birla Foundation Most noted work- Vyomakesh Darvesh (Biography and criticism of Hazari Prasad Dwivedi- a literary historian).